Flag: in the colors of the CoA; made out of three vertical bands in ratio 1:2:1. 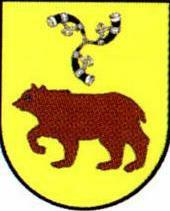 Side bands are Brown - Middle band is Yellow (Gold) - On it - Brown Bear with three horns (musical instruments) over it in Black color. Obverse: on the golden field brown bear; above the bear three horns; around it a legend "Miasto Wegrow" (so I am not going to confuse it with the County anymore - "TOWN OF WEGROW"). On all sides there is a brown border. Reverse: on the red field the State Arms (of Poland) surrounded by the laurel-oak wreath in silver. Also, silver legends: at the top "Bog, Honor" - ("God, Honor") and at the bottom - "Ojczyzna" - ("Fatherland").